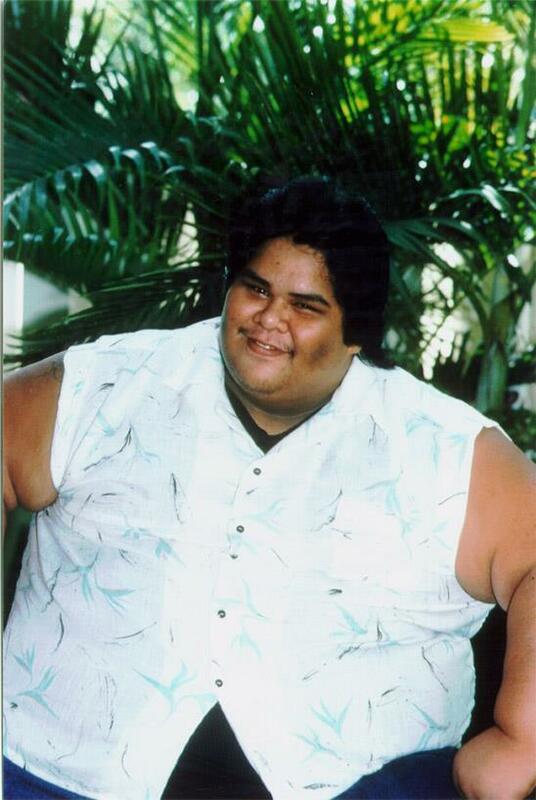 As the decades pass, Israel Kamakawiwo’ole’s legacy grows stronger. His recordings are always in demand world-wide, and are regularly featured in motion pictures, television broadcasts, and countless advertisements. 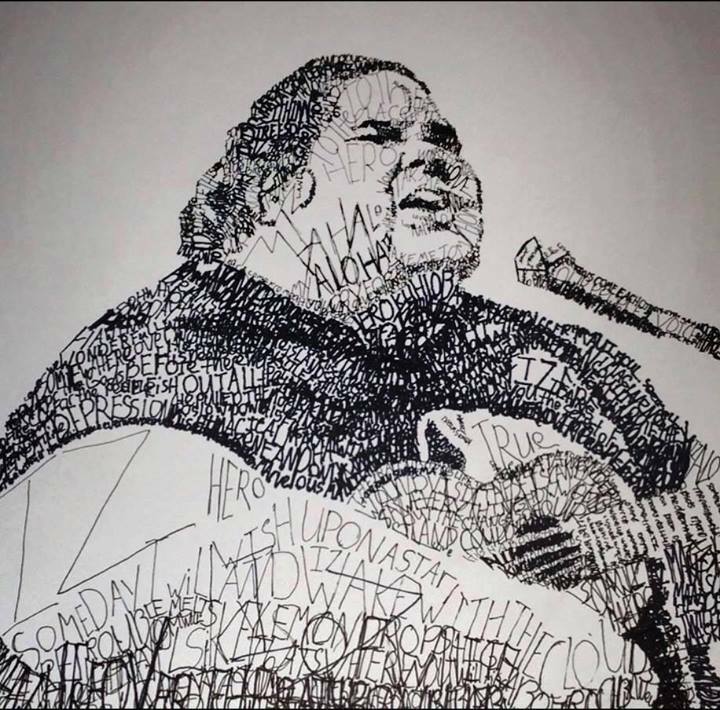 Israel IZ Kamakawiwo’ole singular Hawaiian voice penetrates the personal complexities of our daily lives and probes our musical passions. Click to listen to the album. 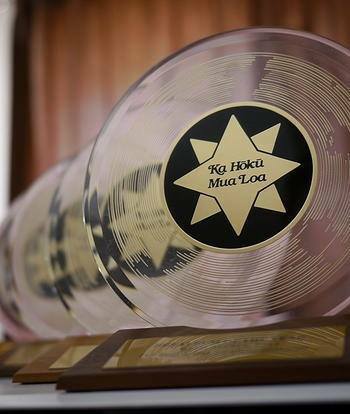 IZ will be an honoree of this year’s Nā Hōkū Hanohano Awards’ Lifetime Achievement Awards! 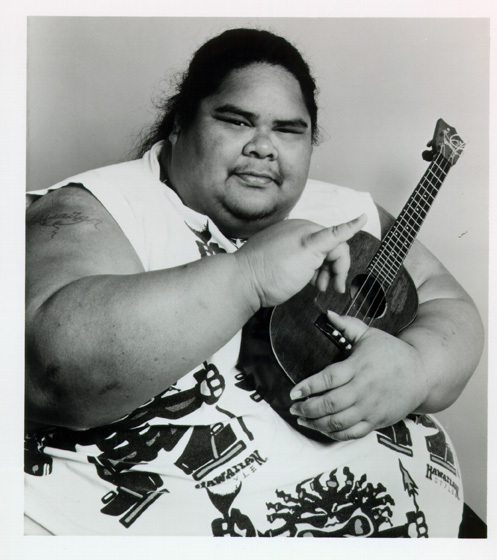 He’ll be joining some great names in Hawaiian music at this very special occasion! The Lifetime Achievement Awards Luncheon will be held in May. A little Throw Back Thursday! Check out this awesome tribute to IZ via Island 98.5 and We Still Mighty! 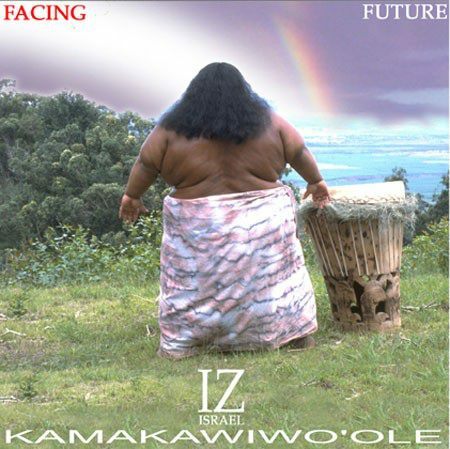 We want you tell us your Facing Future/Israel Kamakawiwo’ole story with a video or a picture! • Did you know IZ or get to meet him? Describe how, where and what happened. • Do you have an autographed copy of this CD or any poster, hat, Tshirt? Take a picture and share it with IZ fans everywhere. • Submissions can be anonymous, but feel free to include your name and location! IZ’s music has touched people around the world and the emotional response of the listener is exactly what music should do! As an added bonus, we will pick ONE submission to win an IZ prizepack! A T-shirt, the entire IZ CD collection (Facing Future, Alone in IZ World, IZ in Concert, E Ala E, N Dis Life, Wonderful World) IZ, The Voice of the People book, and a hook necklace! Submissions will be accepted til December 31st, 2013! Submission Agreement: By submitting your materials for inclusion in the 20th Anniversary Facing Future promotion, you are granting permission to Mountain Apple Company/Big Boy Records to use those materials for promotional purposes and are warranting that you have the right to grant this permission. 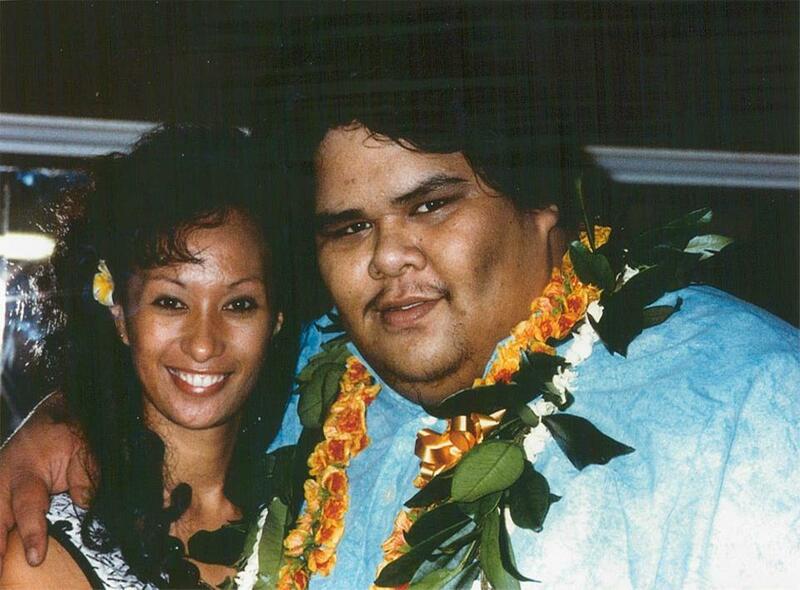 Two generations of amazing Hawaiian music artists!! 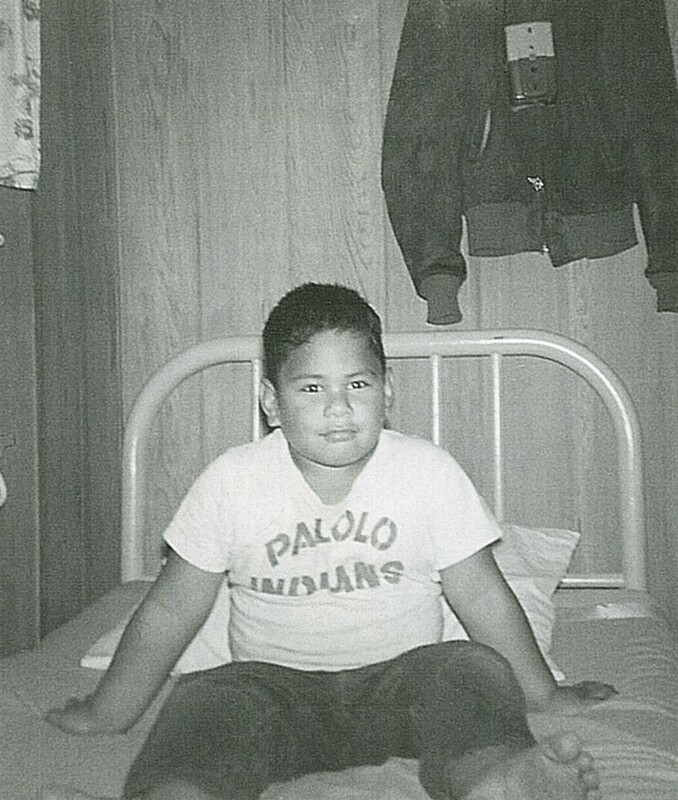 This is one of my fondest recollections from being a kid in school, growing up in Hilo…….The day IZ came. He was (and is) such a role model for me. 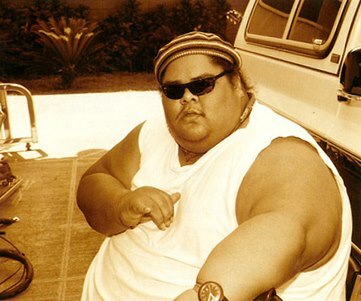 I enjoy his music, but more importantly, he was the first Hawaiian I really saw being successful. 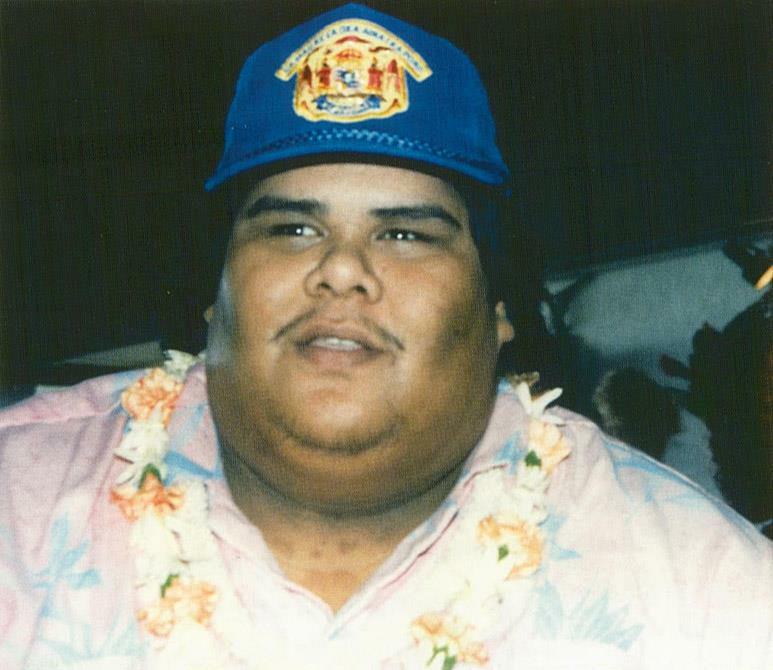 Through his career, I saw the promise of a future in Hawaiian Music. 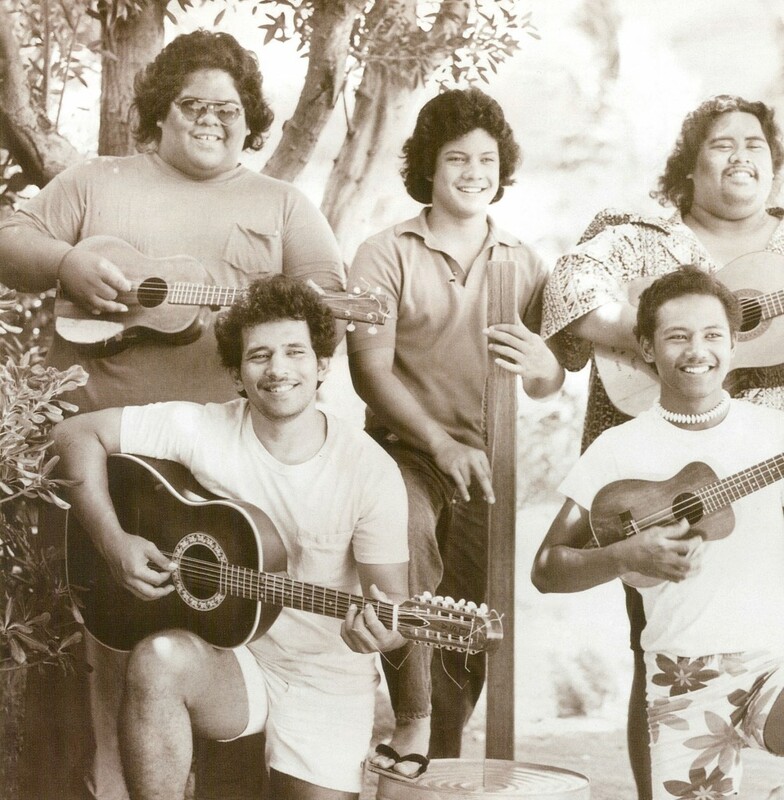 Check out Kuana’s solo work as well as his group, Na Palapalai! More awesome and unique fan art from Osanai Makoto! Sarah Brightman/IZ Duet – PREVIEW! Wayne Harada on Brightman/Iz duet – “Hawaii ’78”! Check THIS out! 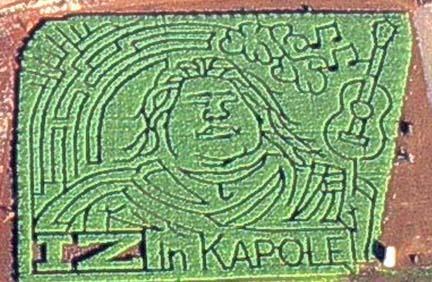 IZ Corn Maze as seen from above made to commemorate the singer. Created by Aloun Farms in Kapolei, 2001. 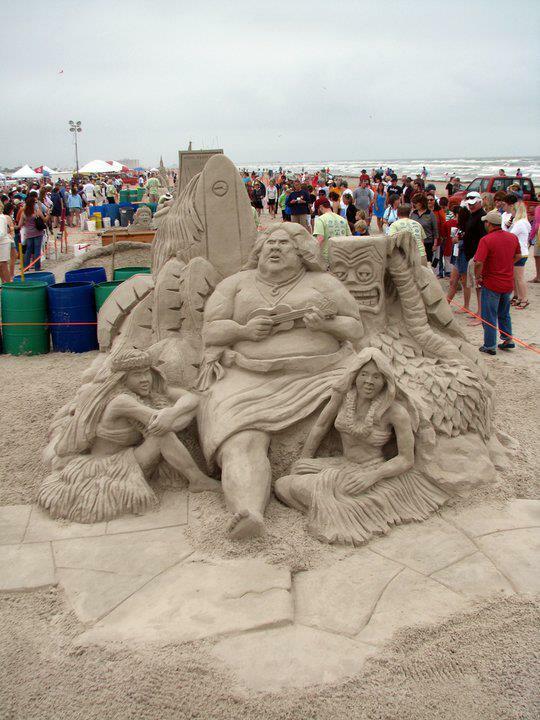 IZ fan art from a Sand Castle competition in Texas. Have you created or seen any IZ artwork? Let us know in the comments or send us a message! 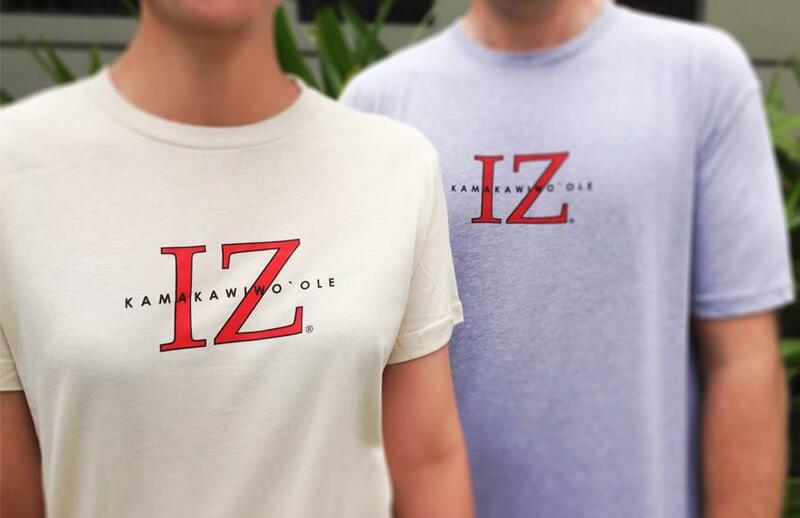 IZ Apparel BACK BY POPULAR DEMAND! 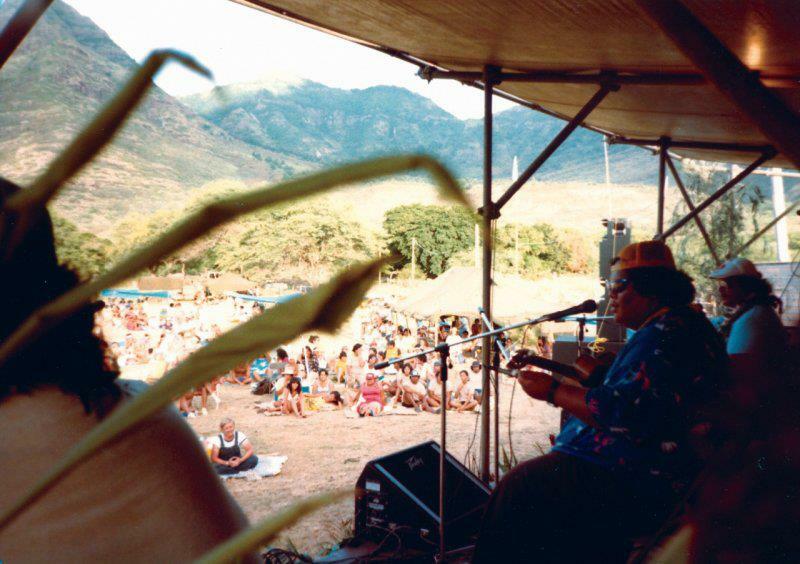 A clip from the Israel “IZ” Kamakawiwo’ole DVD, “IZ: The Man and His Music – Island Music Island Hearts.” Features interviews, live performances, and a simple glimpse into one of Hawaii’s most treasured musicians. Experience the bigger than life personality of IZ and learn about the man behind the music. Purchase your copy of Island Music Island Hearts today. IZ on, “Hot Hawaiian Nights”! A clip from the IZ DVD, Hot Hawaiian Nights. IZ plays with fellow musicians Roland Cazimero and Mel Amina. 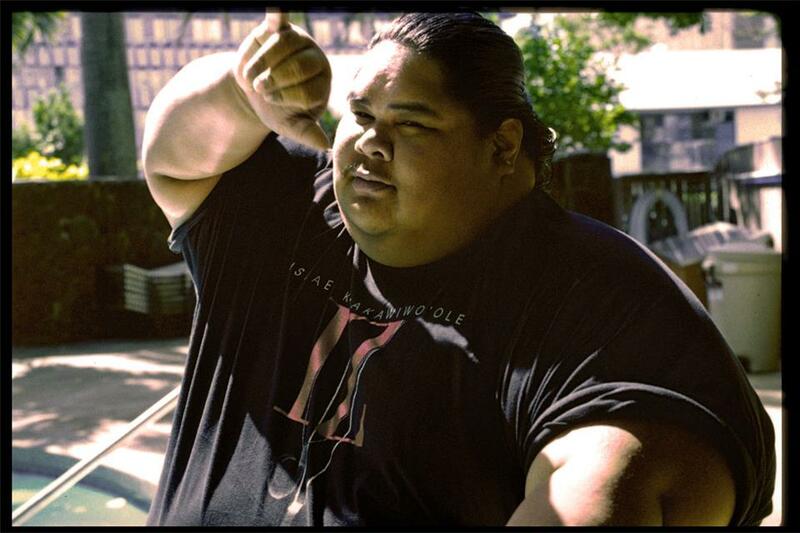 A clip from the Israel “IZ” Kamakawiwo’ole DVD, “IZ: The Man Behind The Music.” This DVD explores that man, through never-before seen interviews and stories with the help of friends and family who knew him best. Purchase your copy of IZ: The Man Behind the Music today! Check it out! 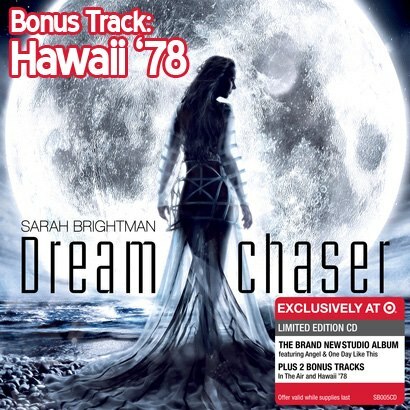 Sarah Brightman’s newest CD release, “Dreamchaser“ featuring a duet track with local boy, Israel “IZ” Kamakawiwo`ole on his hit, “Hawaii ’78”! “Dreamchaser“ is exclusively available through Target! broadwayworld.com Article – Feat. Sarah Brightman and IZ! IZ Tenor Uke Featured in Surfer Magazine! 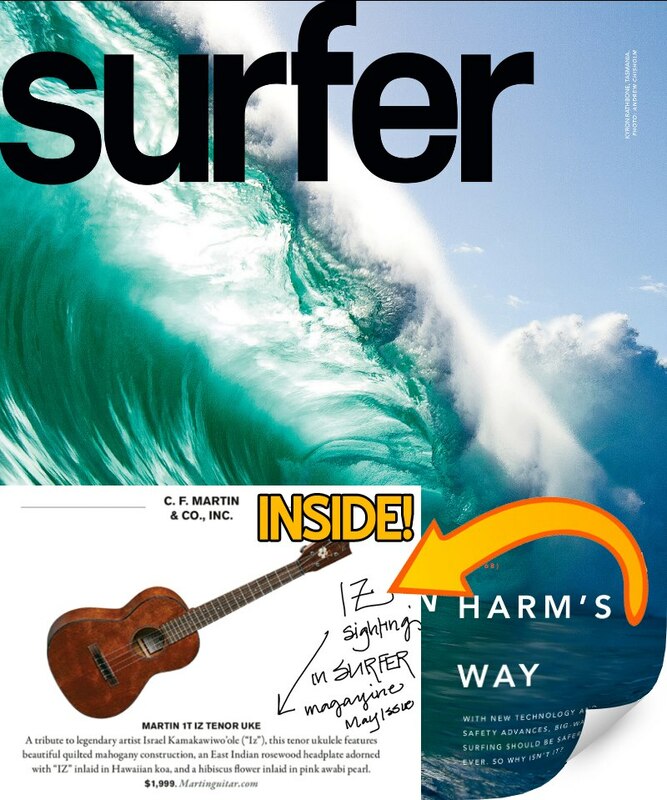 Check out this recent issue of Surfer Magazine to see IZ’s Tenor Ukulele featured! The Limited Edition IZ IT Tenor Ukulele is now available at Martin Guitar retailers nationwide! Just like the Ukulele that IZ loved! Check out this video from the NAMM Convention talking about this Ukulele! Some fans have trouble pronouncing IZ’s last name–do you? How do you pronounce it? Check out some of this awesome fan art of IZ by Thierry Cattant! IZ Tenor Ukulele Now Available! It’s finally here! 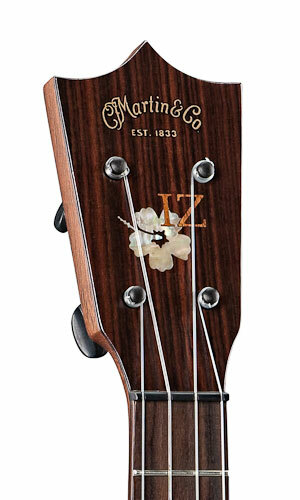 Unveiled at NAMM last week, the IZ 1T Tenor Ukulele is now available at Martin Guitar retailers nationwide! It has a list price of $1,999.00 and has a bunch of awesome features, such as a beautiful quilted mahogany construction, an East Indian rosewood headplate adorned with “IZ” inlaid in Hawaiian koa! Check out Martin Guitar’s website for more details and to find a store near you! Aloha IZ fans! Popular Contemporary Hawaiian group, Sudden Rush, have just released a powerful remix/cover of Hawai’i 78 (one of IZ’s signature songs!) 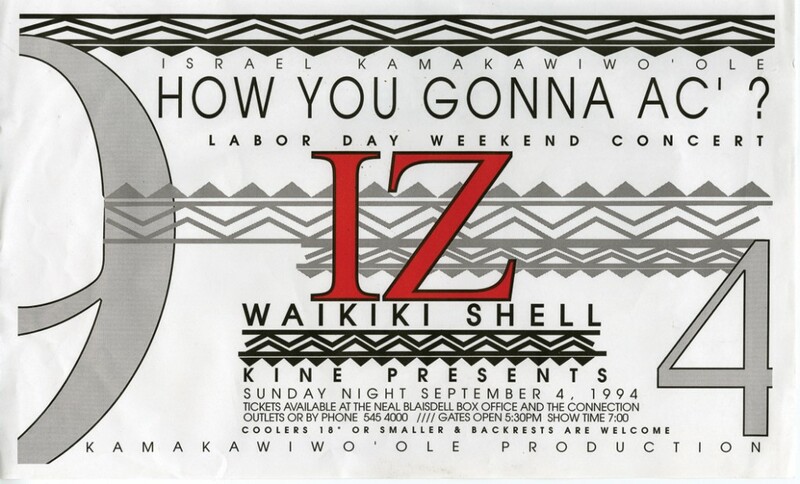 entitled: HAWAII 3000, featuring Uncle Willie K! Check out the preview at our site! Available for $0.99 download, and on iTunes! 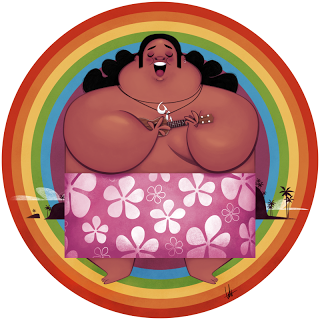 And don’t forget to check out IZ’s version of, “Hawai’i 78”! 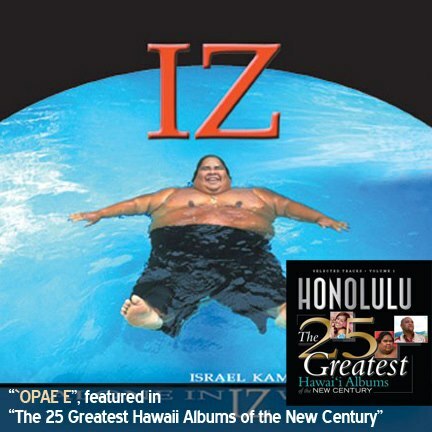 Israel “IZ” Kamakawiwo`ole’s song, “`Opae E” on the album “Alone in IZ World“, is featured in Honolulu Magazine’s “The 25 Greatest Hawaii Albums of the New Century”. The album ranked 3rd on the magazine’s list! 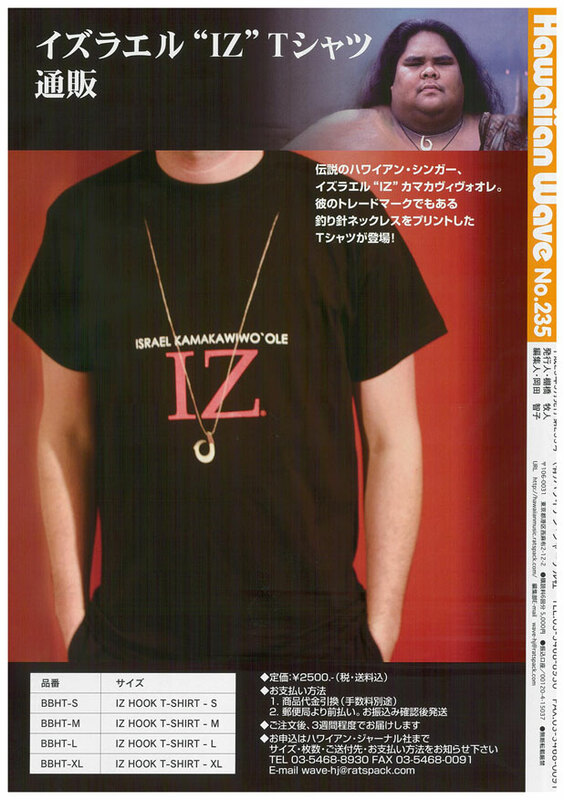 “Alone In IZ World” was compiled after the passing of Iz in 1997. Luckily, Jon de Mello recorded every studio moment to tape – outtakes, banter, lighthearted covers. The result was an unheard revelation. 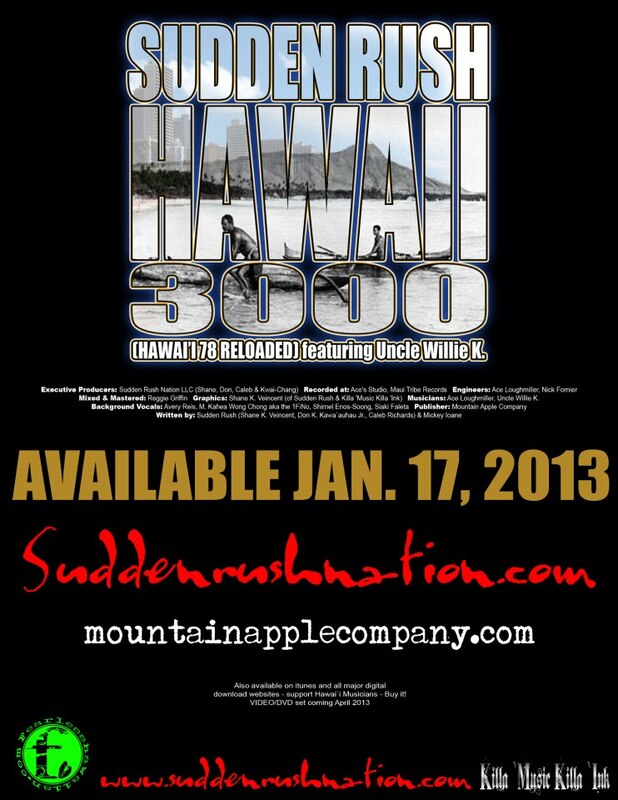 Check out, “The 25 Greatest Hawaii Albums of the New Century” and, “Alone in IZ World” now! Noted rock photographer Robert Knight shot Israel at a karate demonstration by martial arts grandmaster Walter Godin. IZ with his wife, Marlene. IZ at Pat’s in Punalu’u. 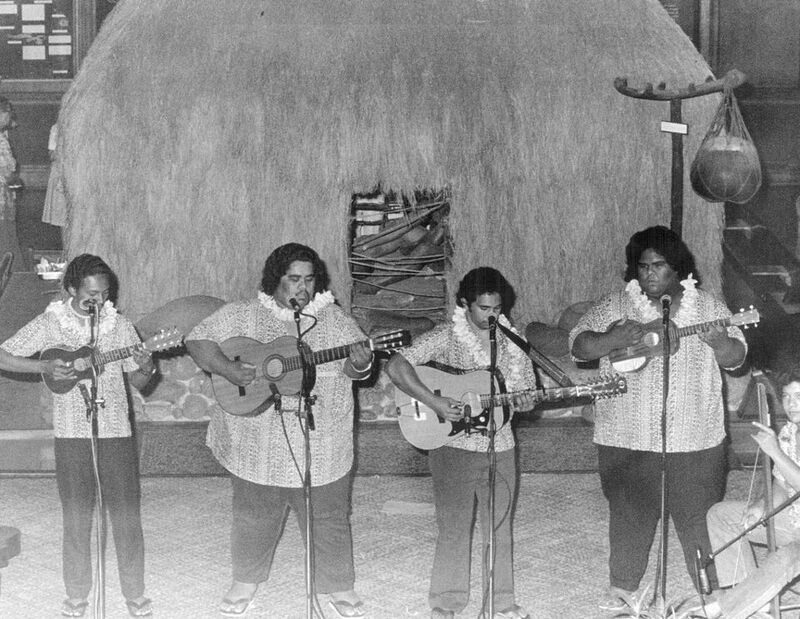 The Makaha Sons of Ni’ihau often played for Sunday brunch at Pat’s at Punalu’u. 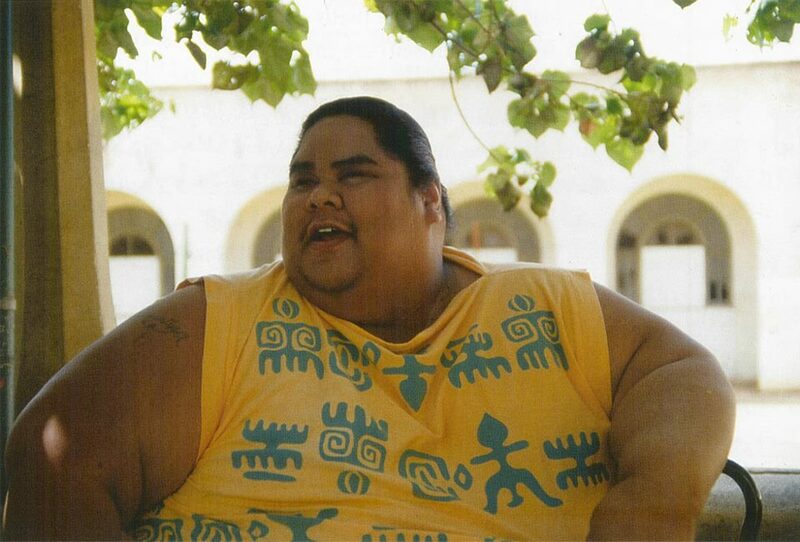 Jon de Mello is Israel “IZ” Kamakawiwo’ole’s producer and lifelong friend. 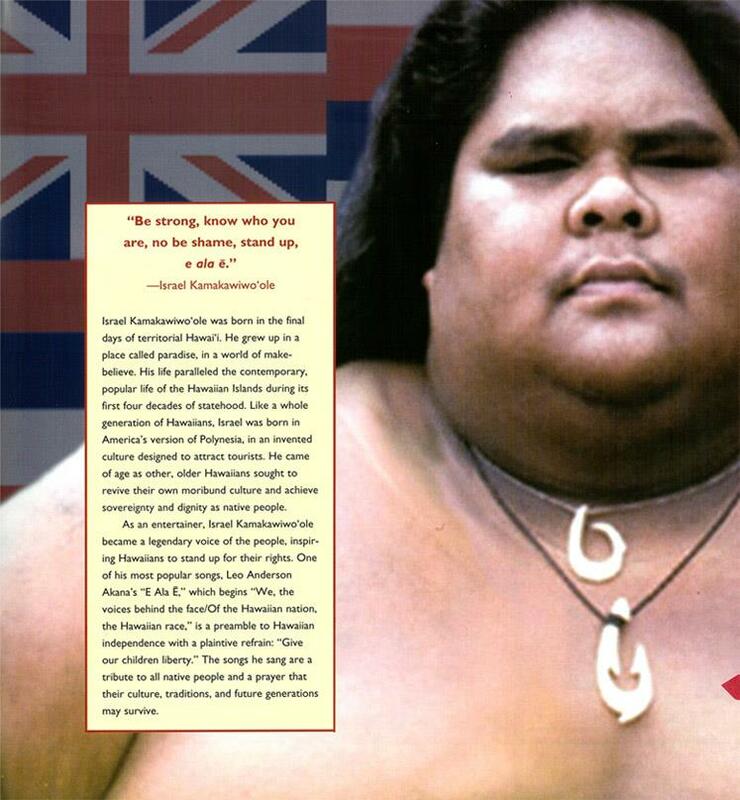 He is the CEO of Mountain Apple Company, IZ’s record company in Hawai‘i. 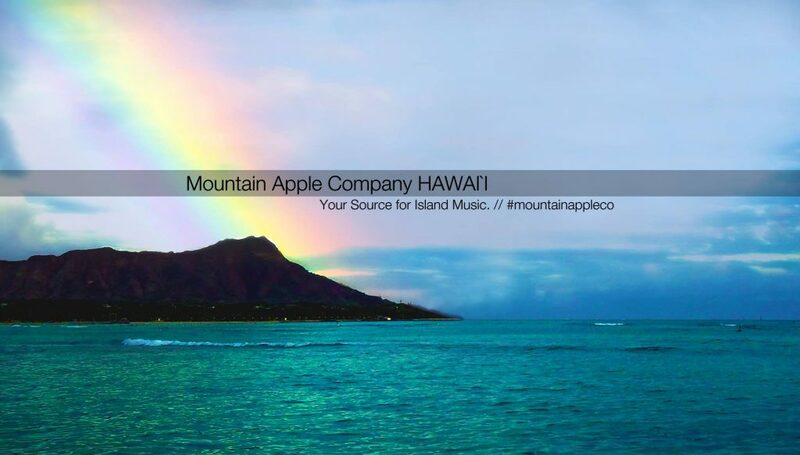 Check out Mountain Apple Company’s Facebook page and discover more great Hawaiian Music! 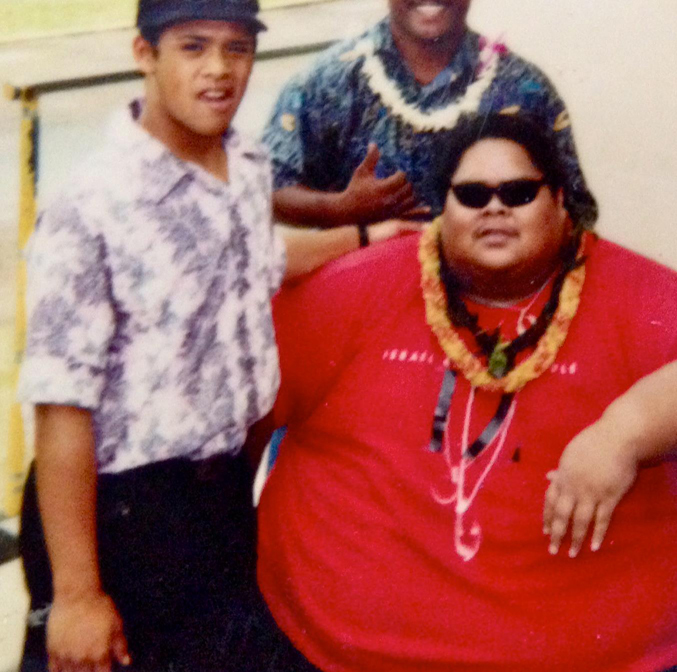 IZ with the Makaha Sons of Ni’ihau. Photo from IZ: Voice of the People, a full color, hardcover coffee table book featuring tons of exclusive IZ stories and photos! A perfect Christmas gift, this book is sure to bring holiday joy to any IZ fan in your life (or you)! Get IZ: Voice of the People HERE! IZ singing for a crowd. Old poster for an IZ Tribute Concert held in 2000. Have you gotten your Official IZ Hook Shirt yet? Get yours today! 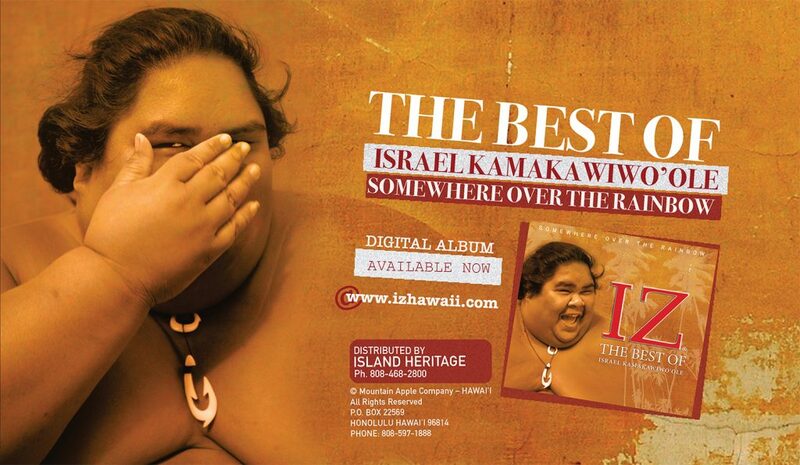 Israel Kamakawiwo ‘Oles Ukelele Version of “Over the Rainbow” was featured at #3 in Terrific Top 10’s list of cover songs, better than the original. “Over the Rainbow” was written by E.Y Harburg for the 1939 movie “The Wizard of OZ”, and was originally sung by Judy Garland. Are you nostalgic for record stores–where fans could browse all kinds of music, and artists had a chance to interact with their fans? 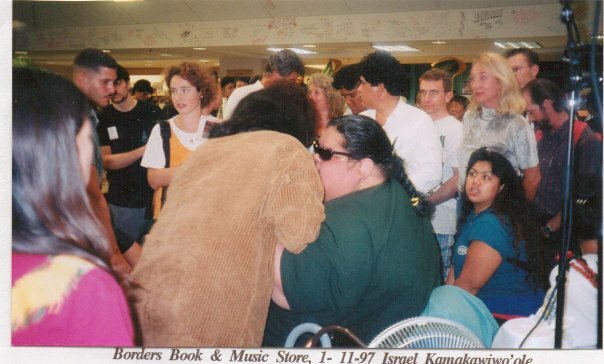 Here is IZ at his last autograph session at Borders Books & Music – Ward Centre, in Honolulu, Hawaii. IZ would always stay til everyone in line got an autograph, no matter how late–even if the store wanted to close. Shelley Coscina, Mountain Apple Company’s VP is in the upper right hand corner. Mahalo to Les Honda from Borders for this wonderful memory! Today we are remembering the great Israel “IZ” Kamakawiwo‘ole and how lucky we are to have had the opportunity to work with him and know him N Dis Life! IZ, you live in our hearts and minds every day! You are missed by millions around the world. 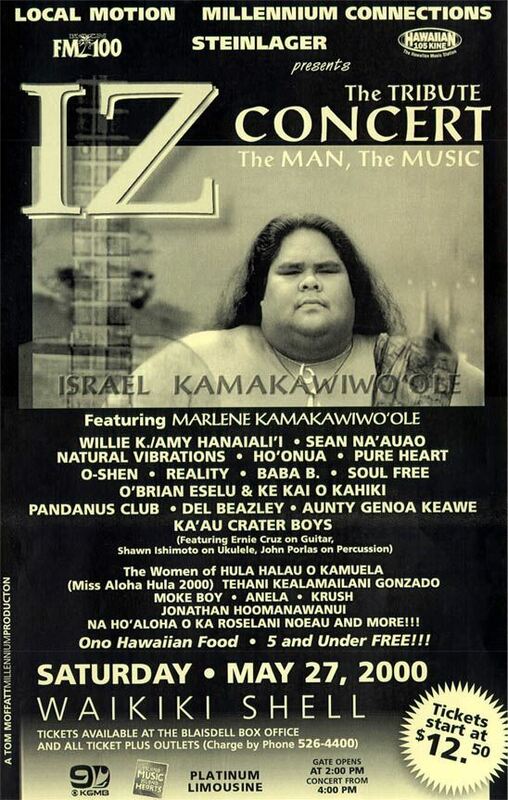 Here’s a trip down memory lane, a rare video of IZ performing almost 20 years ago, with other Hawaiian music greats, Roland Cazimero, Henry Kapono, and Cyril Pahinui! Aloha IZ fans! We’ve finished gathering all the wonderful stories, photos, and videos you’ve shared with us, and put them together on a giant map for all to read and enjoy! Or if you don’t have a story or picture to share and you just want to be listed on the map, you can just put your name and/or location and we’ll add you to the map! Note: Submissions are not automatically added; please give us a few days to add it. Mahalo for your patience. To celebrate this year, we collected fan stories and photos from around the world! Come back tomorrow to check out our brand new FANS section! In the meantime, here’s some other great fan works! This is Sungha Jun, a famous acoustic finger-style guitarist from South Korea; here he is covering “Over the Rainbow”! Here’s a video of a fan who did a digital painting of IZ! Here’s another portrait of IZ by fan Donovan Crisp! Here’s “The Piano Guys” with an instrumental cover of “Over the Rainbow”! Filmed on O’ahu on the North Shore! Did you know Pearl Jam covered “Over the Rainbow” a few years back? Here’s a video of Eddie Vedder giving a very heartfelt performance in concert in Hawaii! Here’s a very cool solo a cappella of “Over the Rainbow” by Youtuber daiyel! 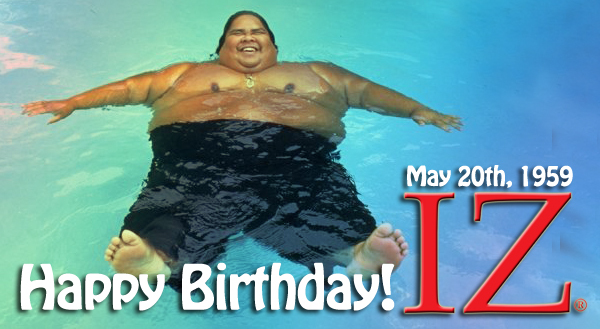 IZ’s birthday is coming up on May 20th. If someone else you know also has a birthday coming up, check out your local Hallmark store for the perfect gift! They’ve got a wonderful music box that plays IZ’s “Over the Rainbow” AND you can record your own personal greeting! When someone opens the box, it will alternate between your greeting, and the song. It’s also a memory box, and you can add your own photo and other keepsakes. Here’s a demo of the music box in action! Call your local Hallmark store for availability. http://stores.hallmark.com/ Retail price, $19.99. You are a huge part of IZ’s success. Now become part of his story. 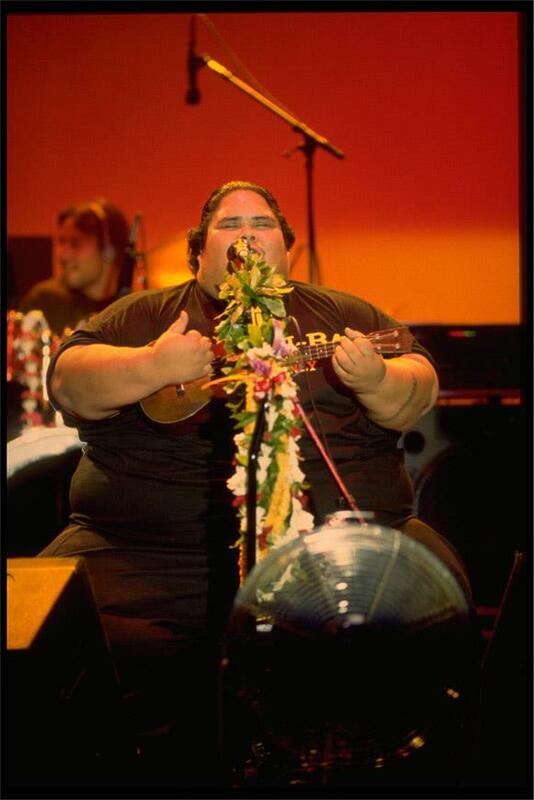 His ‘ohana (family) around the world has grown in to a tight-knit, knowing community of music lovers. Get to know this community better by hearing their story and comparing it to yours. Tell us how you discovered IZ, did you see him in concert, what’s your favorite song, how often you listen to IZ, has his music helped you through a rough patch?…it’s all part of the story. Send us your IZ stories, photos, artwork, videos, etc. 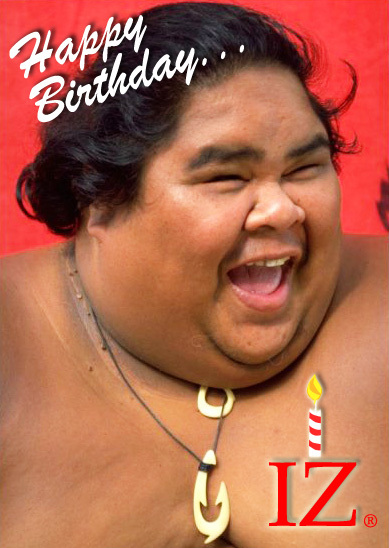 and on the week of May 20th, IZ’s birthday, we will post all the submissions we’ve received from you, the fans. How to submit your fan story: Just fill out the form below! Click here or scroll down. If you have any questions or trouble with the form, please comment or email us. Over time, we have heard from fans around the world where they told us of babies being born while IZ played in the background; or consoled by IZ’s music, sad goodbyes as people have dealt with death; countless brides have told us they walked down the aisle to Over The Rainbow. Adults have told us that when they were a small kid, they stood in line to get an autograph and still cherish it. The rainbow of fans around the world and their love of his music is what connects these unique memories all together. We’d love to share your story with the world. 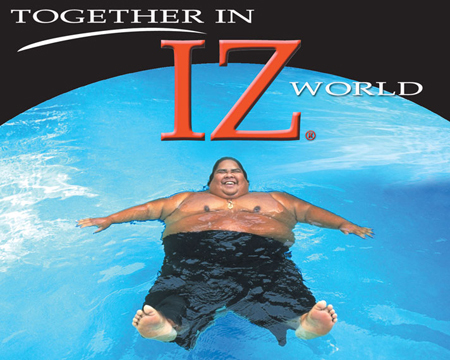 Submission Agreement: By submitting your materials for inclusion in the Together in IZ World promotion, you are granting permission to Mountain Apple Company/Big Boy Records to use those materials for promotional purposes and are warranting that you have the right to grant this permission. Note: Please don’t panic if you see a grey/blank screen after you submit the form. If you scroll up you will see the confirmation that your submission was received. Aloha everyone! Please “LIKE” the Mountain Apple Company Facebook and receive FREE downloads of IZ songs! Mahalo! NEW IZ Digital Download – Fan Favs! Aloha IZ fans! 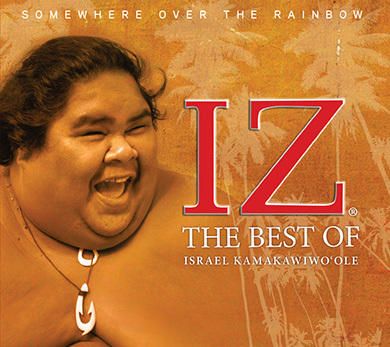 We’ve JUST released a new IZ compilation, exclusively for download at izhawaii.com! 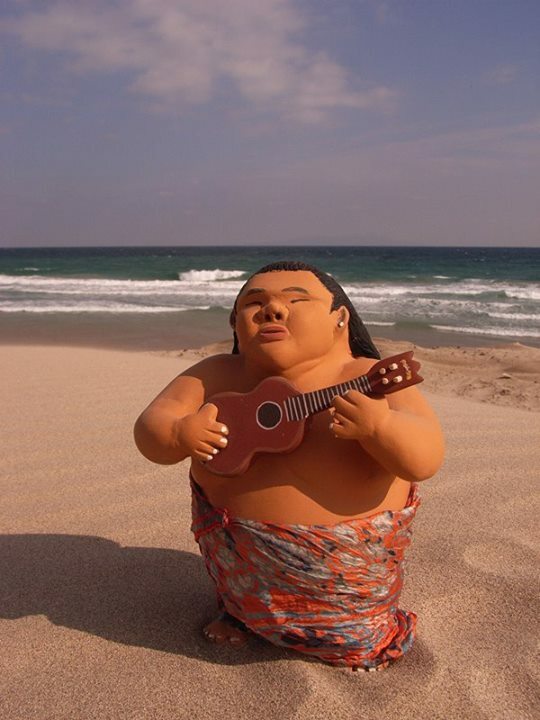 It contains 10 fan favorite songs as well as a BONUS never before released track of Hawaiian Sup’pman, available ONLY through this special album download. Just click the link! For those looking to share IZ with their family and friends, this album is a perfect selection of songs to introduce IZ into their world. Aloha! IZ Facebook passed the 50k fan mark! IZ’s Facebook just surpassed 50,000 fans/likes over the weekend!! 🙂 A HUGE mahalo to all the fans, new and old, from Hawaii and around the world, for all your support! IZ would be so proud. And keep IZ’s spirit going and continue to share his music! We’ll be at 100,000 fans in no time! Check out this rare footage of IZ performing at a correctional facility in Hawaii, back in 1994. The song is “Pakalolo Will Tickle Your Feet”! Enjoy! Aloha UK fans! If you receive ARC Music’s mail order catalog, you’ll see none other than IZ’s Facing Future on the cover for Spring 2012! 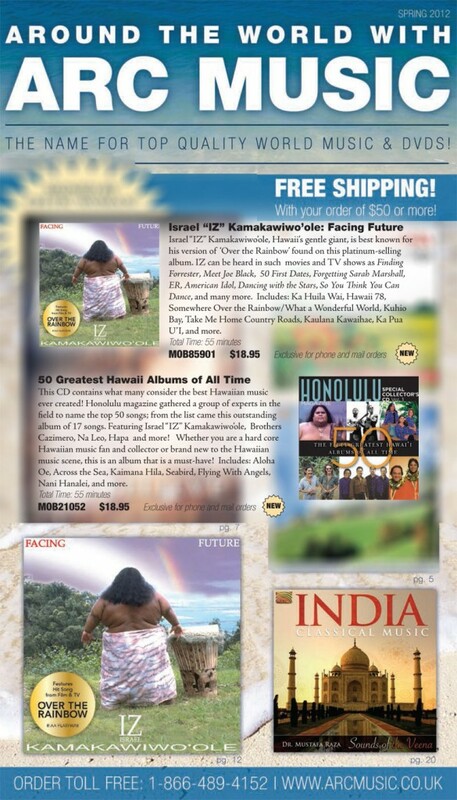 ARC Music boasts the largest and finest selection of World and Folk music, and we’re so happy they chose Facing Future and 50 Greatest Hawaii Albums of All Time as featured titles! This song was composed by IZ’s dear friend, Leo Anderson Akana. IZ found it inspiring and wanted to record it. Jon de Mello decided that it was the perfect song and had the perfect addition… a recording of Hawaiians chanting from some of the observations of the 100th Anniversary of the overthrow of Queen Liliuokalani. E Ala E continues as an anthem to the Hawaiian people as they acquire proper recognition as the indigenous people of Hawaii. E Ala E is available on IZ’s album of the same name! From the first album we worked on with IZ, he insisted on doing a favorite of his, White Sandy Beach. IZ told us that a man named “Willie Dan” was the composer, but Mountain Apple Company could not find the publisher or composer, despite looking high and low. It was about a decade after IZ’s passing that “Willie Dan” finally contacted us. One of the reasons that we couldn’t find him was that “Willie Dan” was a pen name for his compositions! 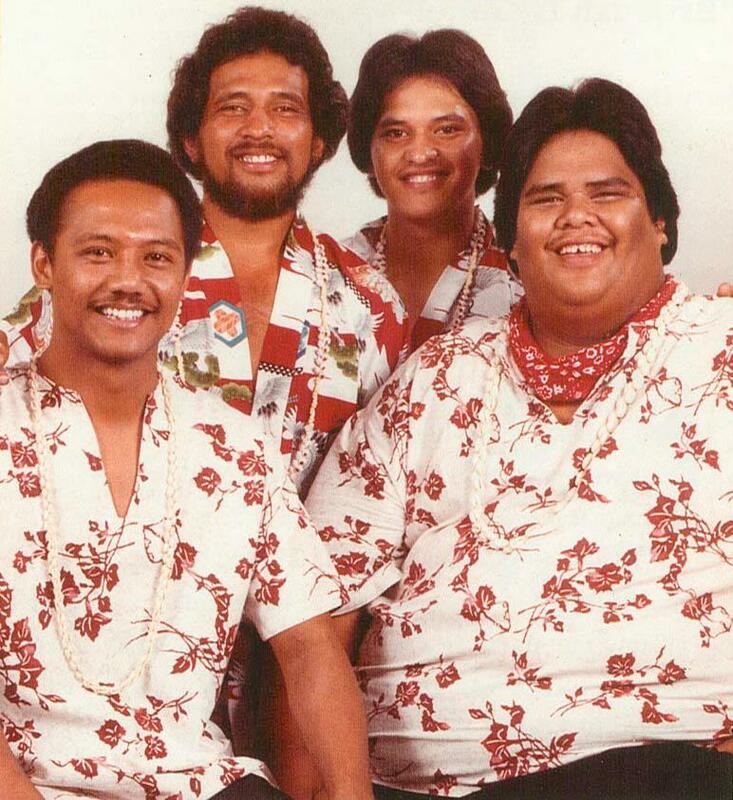 Anyway, we were finally able to connect with the composer, and now Mountain Apple Company is the publisher of this great Hawaiian song. Even though IZ never got to know “Willie Dan” we’re sure he’s happy that their collaboration continues to bring joy all over the world. White Sandy Beach is available on IZ’s album Facing Future! Braddah Iz article on dailykos.com! Have you ever wanted to play some of IZ’s songs? Maybe your New Year’s resolution was to learn to play music? As part of our New Year’s sales we have IZ’s Wonderful World Songbook – Easy Piano on sale for $9.98! (was $19.98) Check it out! “Over the Rainbow” in NYC Times Square on New Years! “Over the Rainbow” was played in New York Times Square on New Years! Check it out on this brief clip.. Even more pics from IZ: Voice of the People! More pics from IZ: Voice of the People! This week’s IZ clip comes from a Dutch insurance company. This commercial shows the full spectrum of the human experience, the ups and downs and everything in between. “Over the Rainbow” is definitely in the soundtrack to life for many of us! IZ’s “Over the Rainbow” is a song that really makes you stop and smell the roses in life. This Italian car commercial emphasizes enjoying the sights, sounds, and feelings that surround you while driving. Where’s your favorite place to relax and listen to music? Driving in the car? Relaxing on the beach? NHK’s Amazing Voice will be doing an episode featuring The Brothers Cazimero and IZ! They were at our office today filming! The episode will air in Japan some time in early 2012. IZ in Austrian Sugar Commercial! This Austrian sugar commercial shows how a childhood dream can be reached, “Over the Rainbow”! What’s your favorite sweet that takes you, “Over the Rainbow”? Here’s a clip from the Adam Sandler/Drew Barrymore movie 50 First Dates (which takes place and was filmed in Hawaii!) featuring “Over the Rainbow” in a sweet, romantic tone. Do you know someone who played IZ at their wedding? This week’s IZ clip is from the TV show, Aerial America, which explores the United States from a bird’s eye view. 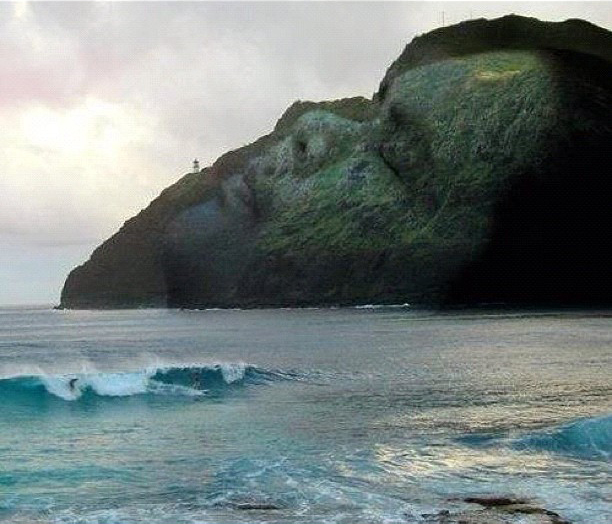 Get a glimpse of Hawaii’s scenic beauty that inspired IZ’s music! For fans who don’t live in Hawaii, have you ever visited the islands? If so, what’s your favorite scenic lookout here? IZ continues his sweep across Europe! “Over the Rainbow” is quickly climbing the charts in Spain and is the #2 most downloaded single on iTunes there!! Here’s a clip from Spain’s TELE 5, featuring “Over the Rainbow”! 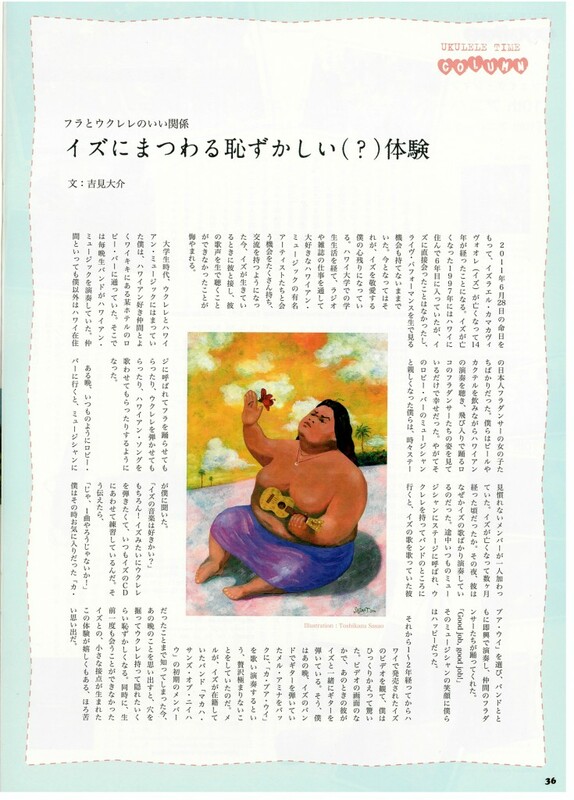 IZ was recently featured in the Japanese magazine, Ukulele Time. Here’s all the articles for any Japanese speaking fans! Click on the other images to check out the other articles! This clip features one of our favorite cereals, Rice Krispies! 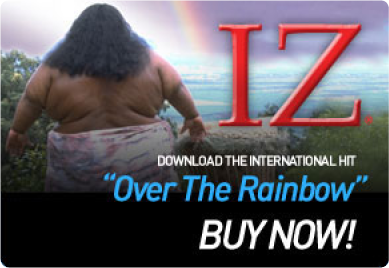 “Over the Rainbow” has been used in so many commercials that are aimed at children and young parents because of the gentleness and innocence of IZ’s voice. Do you listen to IZ with your kids? (He’s sure to calm them down!) Take a look at what Kelloggs did with this Rice Krispies commercial! What’s YOUR favorite cereal? IZ’s music has been heard in movies, too! “Hawai’i 78” was featured in the 1996 film Race the Sun. 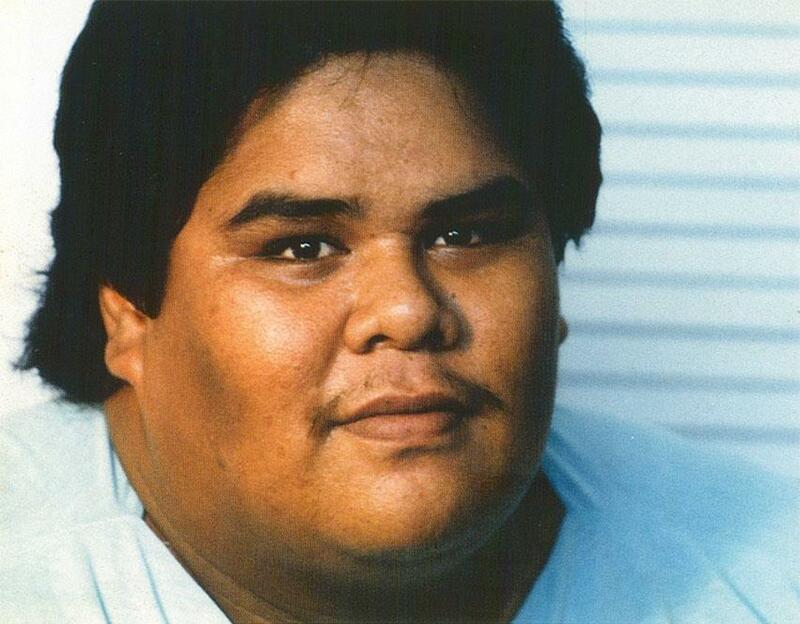 It was based on the 1990 solar race car team from Konawaena High School that went to the World Championship that year. 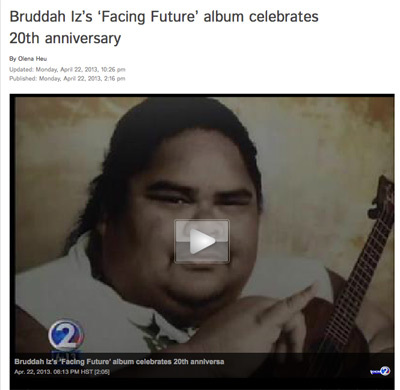 IZ loved having his song in this movie as it was about kids from Hawai’i, and he loved kids. 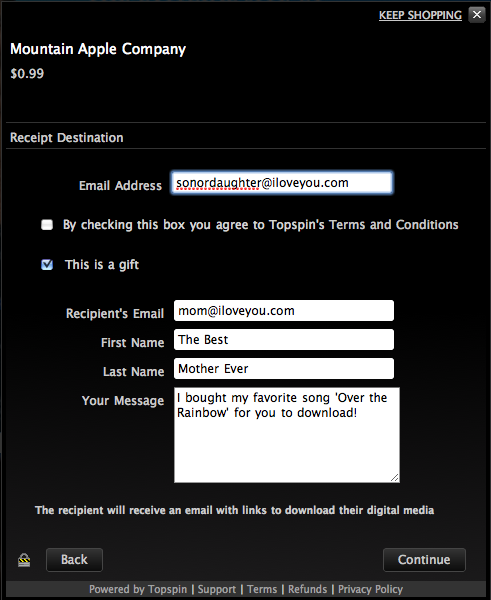 And if you like the song, we’re offering it as a free download! Just click the button below! It comes as no surprise that IZ is well loved in Japan, here’s a sample of what fans are seeing over there! If you’d like to get this t-shirt, it’s available at our store! Here’s this week’s IZ commercial clip! This Korean cosmetics/health food company used “Over the Rainbow” to showcase the essence of nature in their products. It only makes sense to use a beautiful song to promote beauty products! IZ’s voice complements a range of themes and emotions. Last week we brought you a cute and very clever little old lady, this week, we’ve got a whimsical bank ad from Hungary, it definitely lives up to the “rainbow” in Over the Rainbow! IZ’s rendition of Over The Rainbow has inspired so many producers to cleverly use the song….check out what the Lotto in Norway did! Let us know what you think! 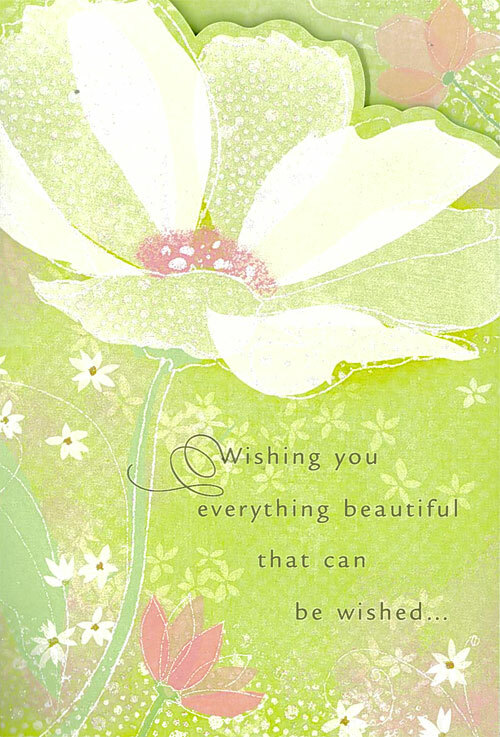 Over the Rainbow… in a card! IZ #1 on UK iTunes! 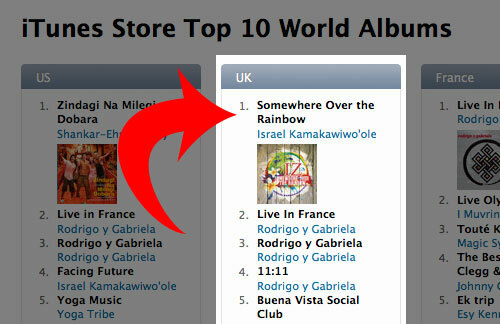 Over the Rainbow is #1 on the UK’s World music charts on iTunes! IZ’s Music Sweeping Across the World! IZ T-Shirts and Sticker’s now Available. 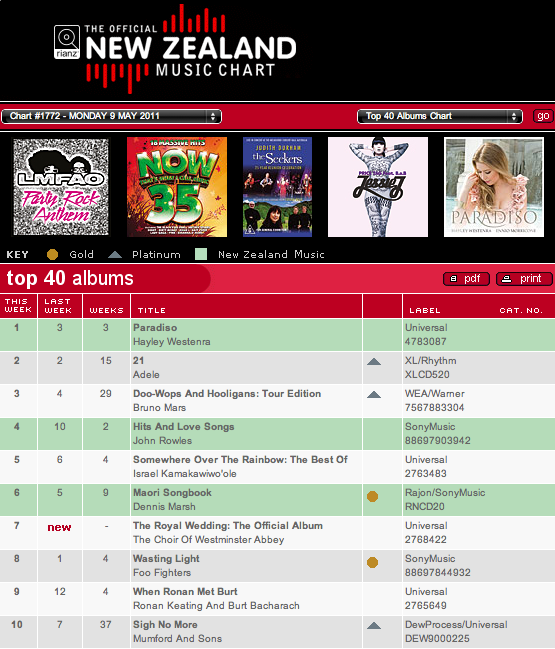 IZ hits #1 in Portugal and #5 in New Zealand! Get the IZ App Now! We are excited to announce that IZ has officially hit the mobile web with his new App! It is available on iTunes, Android Marketplace and the Blackberry App World. Best part is, it’s FREE. Get it here!